Edge of Reason: Bo Obama - PR Superstar! This weekend I discovered Bo. Bo Obama. Now while I knew about Bo, what I did not know is that Bo had such a huge online presence. And I am not just talking about articles about Bo, but official and unofficial blogs and tweets and Facebook pages Bo is a social media superstar. Is it any wonder, considering that his master used the tools so skillfully in his presidential election campaign? 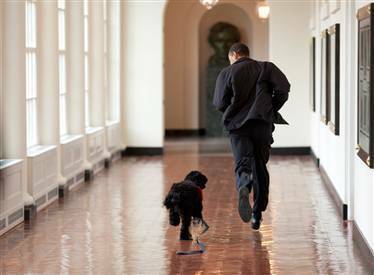 Now what I like about Bo, besides being a dog lover myself, and loving anything doggie, is that Bo is just another piece of the Obama brand and a piece that has not been forgotten. Of course all eyes are on the President when it comes to policies, both home and foreign, and all that other presidential stuff, but the President is also a regular guy, with a family and of course, a dog. 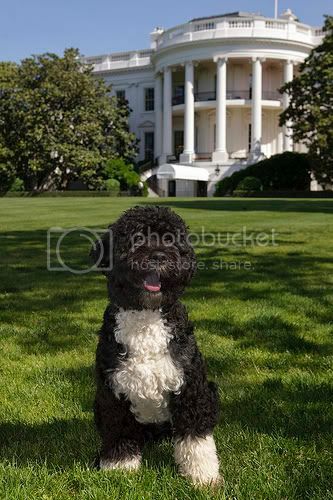 And say what you will about it, Bo is part of public relations gold, because there will always be an audience out there who is interested in the other parts of the president's life - what he likes to eat, read and what's going on with the kids, and the dog. While the parents may not want to open up the kids to such public scrutiny, I don't quite think Bo Obama minds being such a public sensation. It's just another part of the brand machinery behind the President, who has opened up the White House to the world as never before, and who has leveraged both traditional and new media to keep in touch with the public on both business matters and not-so-much business matters. Though there have and will be missteps where this is concerned, he continues to have a broad appeal and you can be sure that the peek into his everyday life has helped that. In much the same way, customers want to do business with real people and though I hardly advocate pets' blogs in order to achieve this, the insights which can best be shared via social media should be encouraged. And whether it's sharing information on staff activities in communities, or creative peeks at the daily operations of the business, now is the time to start building communities not just around your products and services but around your people, ultimately humanising your brand. Brands should not be afraid to talk about themselves and of course there are still issues around employees and how they use social media to promote the brand, but the time to start not just thinking about it, but doing it is now. I still love Bo though. He's such a star!